This 16th century engraving, which was included in Braun and Hogenberg’s Civitatis Orbis Terrarum Volume II (Cologne, 1575), has recently been acquired by the Friends of St George’s and Descendants of the Knights of the Garter for St George’s Chapel Archives and Chapter Library. 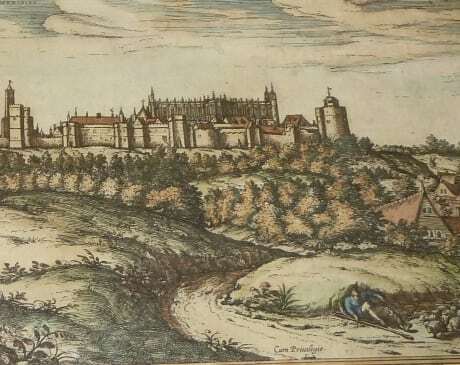 One of the earliest published representations of Windsor Castle, it reproduces a drawing of the north side of the castle by Georg (Joris) Hoefnagel. The original pen and ink drawing, probably based on sketches taken by Hoefnagel when he visited England in 1568-69, is held by the Royal Collection (reference RL 12936; W&C 53). 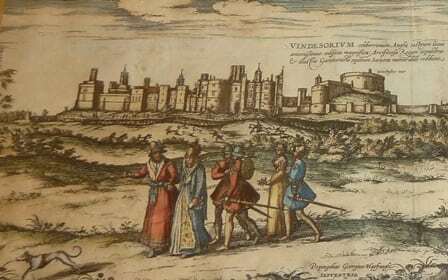 The illustration, which shows Windsor Castle and St George’s Chapel from the north, almost certainly predates two other representations of the same view: one was included in the second edition of Foxe’s Acts and Monuments , published in 1570, and one appears in in the background of Marcus Gheeraerts the Elder’s engraving of Queen Elizabeth in Procession with the Knights of the Garter, dated 1576. Hoefnagel’s picture includes the Curfew Tower (formerly known as the Clewer or Julius Caesar Tower), with its wooden bell frame projecting above the tower parapets; the tiled roofs of the Vicars’ Hall and the Canons’ houses; and the pathway leading from the Canon’s Cloister to the Dean’s orchard. Other noticeable architectural features are the Chapel roof with its pinnacles and sculpted King’s beasts (removed in the 17th century on the recommendation of Sir Christopher Wren) and the Round Tower (incorrectly labelled ‘Winchester Tour’) before it was heightened by George IV. In the foreground, two well-dressed couples are walking in the park accompanied by a dog and two armed guards and, on the right, a shepherd dozes unmindful of the flock at his feet. In the middle distance a stag hunt is taking place in front of the fenced terrace or ‘new wharf’ created by Henry VIII below the royal lodgings. Curiously there is no sign of the river nor of the steep incline leading up to the castle walls. The view was both drawn and subsequently engraved by Georg (Joris) Hoefnagel (1542-1600), a talented Flemish artist and printmaker. He was one of over a hundred of different artists and cartographers who engraved copper-plates to illustrate the Civitates Orbis Terrarum which was published in Cologne between 1572 and 1617. When completed, this great city atlas in six volumes contained 546 prospects, birds-eye views and maps of cities throughout the known world. It was edited by Georg Braun (1541-1622), a cleric from Cologne, with the assistance of engraver and mapmaker Franz Hogenberg and of Abraham Ortelius who, in 1570, had published a systematic collection of specially engraved maps in his Theatrum Orbis Terrarum, considered to be the first true modern atlas. A later edition of this atlas, revised and edited by Balthasar Moretus in 1624, is held in the Chapter Library [SGC RBK O.34].